What is meant by the term "continuo" is a type of bass line which was written (particularly about 1650-1750) for a keyboard instrument playing an accompaniment or taking part in an ensemble, and which required a special interpretation. Given a single bass note, the player had to work out for himself the correct harmonies to play above this note; he was commonly, but not always, helped by figures giving a kind of shorthand indication of the harmonies required (figured bass). To play the continuo therefore, is not to play a particular kind of instrument -- it is to play on any keyboard instrument from this particular kind of bass. It was customary, back in the day, for the actual bass notes, though not the harmonies above, to be sounded also by a cello. During the Baroque period this method of notation was used very often because it saved composers time (AND it saved them money because paper was so expensive in those days), so they simply wrote out the bass line and put in some Arabic numerals (numbers) and signs under it to indicate which other notes in the harmony belonged with it. It is therefore a system of abbreviations in which there is only a bass line written for the left hand, below which are Arabic numerals (numbers) and signs; based upon those numbers and signs the player then fills in the chords above the left hand bass note with the right hand -- always a single bass note with the left hand and a 3 or 4 note chord in close position above it with the right hand. How these chords are filled in depends partly upon the tempo of the piece; if the tempo is fast, then only chords are sufficient, but in a very slow tempo more notes can be added, such as 3rds and 6ths, to thicken the texture of the harmony. Such 3rds and 6ths sound nice and are good intervals for functional harmony whereas the perfect pure intervals (i.e., 5ths and octaves) sound empty and lead to faulty progressions when in parallel motion. Major and minor 3rds and 6ths however are the most beautiful in tonal harmony and could be used in alternation or parallel motion. When J.S. Bach would play continuo, it's said that he would add one extra voice, always ... one completely thorough composed voice; if it were a duet, he would add a trio texture; if it was a trio, then a quartet would sound. Bach was supremely gifted at this and could think very fast horizontally as well as vertically, which is an amazing, very hard thing to do. Most people, if they had to do it in written form, could probably do this too because they would have time to think about it, but if they had to do it on the spot while sitting at the instrument it would be very difficult for them. This is because the closed position (of harmony for the right hand) is so perfect for continuo playing. It's a matter of practice, of course, how fast we can think, and to be able to think as fast as we can play, but for starters it's plenty good enough to be able to add the correct notes to the bass line while given only numbers or symbols below it. Actually, this isn't quite as hard as it sounds because we just have to think about the melody that the other voices above the bass are playing. It's important for a serious student of the organ to know what continuo is and something about its realization -- it's necessary for an understanding of the inversions of chords and for the playing of certain scores from the repertoire, as well as being part of the language with which musicians communicate with one another. The top staff (photo) shows the realization of the figured bass notated in the bottom staff, in this example. The first bass note is C, unfigured; this refers to a root position of a C major chord, with the root in the bass; if there were a sharp (#) sign, flat (b) sign, or "natural" sign, all by itself above the bass note, it refers to the 3rd of the chord being altered by that accidental. A root position of a chord always has the root of the chord in the bass and is unfigured. So an unfigured bass note always calls for the root position of the major or minor chord above it. This root position chord will be major or minor depending upon what accidentals are, next to the clef, i.e. the key signature. Sometimes composers would add additional accidentals to the clef by writing a "#" sign, "flat" sign, or a "natural" sign above the bass note into the notation for the numbers. This would always refer to the 3rd of the chord. For example, an unfigured bass note with a "#" sign below it would mean that the performer would have to raise (sharpen) the 3rd from the bass a half step. The second bass note is an E, figured with a 6; this means that the root of the chord is a 6th above the bass note; in this case, a C major chord again, this time with E in the bass, or a 1st inversion. A 1st inversion of a chord always has the 3rd of the chord in the bass. So a bass note figured with a 6 always calls for the 1st inversion of that major or minor chord. The third bass note is a G, figured with a 6-4; this means the root of the chord (C) is a 4th above the bass note, and the other note in the chord (E) lies at a 6th above it; this is a C major chord again, only this time with the 5th in the bass, or a 2nd inversion. A 2nd inversion of a chord always has the 5th of the chord in the bass. So a bass note figured with a 6-4 always calls for the 2nd inversion of that major or minor chord. In the case of 7th chords, which are 4 note chords, the root position dominant 7th chord is figured simply with a 7 to indicate root position. Technically, this is a 7-5-3 chord, but for the sake of simplicity, it's figured a 7 chord. Any bass note figured with a 7 indicates a root position dominant 7th chord. In a 1st inversion 7th chord, the 3rd of the chord is in the bass, so it's figured as a 6-5 chord, meaning that the root is a 6th above the bass note, and the 7th is a 5th above. Technically, this is a 6-5-3 chord, but since the 3rd of the chord is implied, it remains unfigured. So any bass note figured with a 6-5 implies a 1st inversion dominant 7th chord. 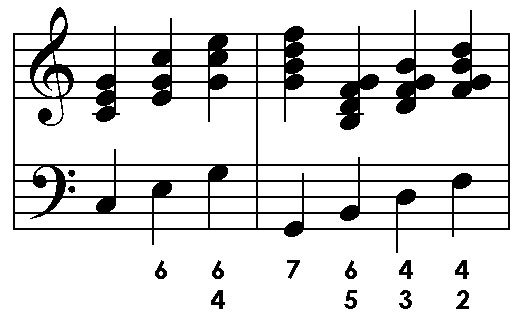 The 7th chord in 2nd inversion has the 5th in the bass and is figured a 4-3 chord to indicate the root is a 4th above the bass note and the 7th is a 3rd above. Here again, technically, this is a 6-4-3 chord, but the 3rd of the chord is implied, therefore unfigured. Therefore any bass note figured 4-3 implies a 2nd inversion dominant 7th chord. In a 3rd inversion 7th chord, the 7th is in the bass; this is figured as a 4-2 chord, or, more commonly, simply a 2 chord, to indicate that the root is a second above the bass (and the 3rd of the chord is a 4th above). Technically, this chord is a 6-4-2 chord, but the 3rd, being implied, is unfigured ... and sometimes even the 5th of the chord, being implied, is also left out of the figuring. So any bass note figured 4-2 or 2 indicates a 3rd inversion dominant 7th chord. Any bass note figured 5-4 indicates a suspension, which leads to 5-3, so it's always necessary to count from the bass up. All of this seems like rocket science at first, but it's just a matter of practice and familiarity. On the organ, the bass note would be played in the pedal usually, with the other notes taken in the right hand. On an instrument without pedals the bass would of course be taken in the left hand. In some older music, composers have added a soprano line for the right hand (2 voices, for the soprano and bass) in the continuo part, so the player only has to add the 2 middle voices (alto and tenor) to realize the implied harmony. 1) If there are no numerals or signs under the bass note, we use the common chord of the note. 2) If there is one numeral (e.g., 5 or 6) under the bass note, we use the corresponding interval in the indicated key (in the key of C Major, a 6 under an E would call for a C, which is a 6th above E, a 7 under a G would call for an F, etc.). 4) When there is a sharp sign (#) or flat sign (b) or natural sign standing alone, we use a major 3rd for the #, a minor 3rd for the b, and apply the natural in conventional manner. 5) When a stroke appears through a numeral, we raise (sharpen) the interval by a semitone (half-step). 6) When a numeral appears with an accidental placed after or before, such as 5#, we raise or lower the interval in accordance with the effect of the sign. 7) When there is a horizontal dash (--), we continue the harmony of the previous chord, even if the bass note changes. 8) When there is a plus (+) sign, this indicates a chord abbreviation (6+ means an Italian 6th, 6 + 5 the German 6th). 9) When there is a zero (0) below the bass note, it means the bass note is solo, and there should be no accompaniment. Passing notes are used to fill intervals between essential notes and are employed on the unaccented parts of a measure, i.e. on the 2nd and 4th beats in quadruple time and the 2nd beat in triple time; sometimes a passing note is placed on the 3rd beat of a measure in quadruple time when the other 3 notes are essential. Passing notes are not figured; a complication of figures would arise by figuring them, which would render the bass more difficult to read than written out harmony; only the essential notes upon which the chords are to be played are figured, and the time of the chord is indicated by a dash (--). In the case of a pedal point, this is a sustained note entering into the construction of harmony of which it is not always properly a part; it's most frequently found in the bass, although it cannot be considered part of the bass and must not be figured; the part immediately above the pedal serves as the bass of the harmony and is figured to indicate the chord. Rarely, a pedal point bass note is may be found figured in certain baroque scores; the figuring then becomes complicated and renders the bass difficult to read.